Packing up for the winter. A month full of activity as the garden closes to visitors and the priority shifts to caring for artworks and infrastructure over the coming season. First on the list is to get all of the larger sculptural works covered and the smaller pieces brought into storage. A week of clear dry weather allows this to be completed quickly, so all should remain cosy under their protective covers for the colder days ahead. We have also seen the first shifts in the weather to more usual conditions – and its consequences – as another wind storm whips through and brings further boughs and limbs down – some more necessary large-scale tree work is now planned to remove damaged and overcrowded specimens. On a smaller scale all of the roses have been pruned back, the herbs and nepeta underplanting in the Hortus cut down, and some of the larger hostas split and separated so that we will have new plants to bring on. The greenhouses are looking well stocked with plants for next year – in particular to naturalise in the woodlands and to fill out the carpet floor effect of the sunken garden. Seeds and cuttings are coming on. In the Kailyard and Allotment beds have been tidied out, the last plants and crops lifted and removed or relocated. The renovation work to the spring water system has been finished and all is running well – there are a few running repairs still required to seal leaks in other ponds but these will be taken care of as a matter of course. The wild flowers by the edge of the lochan have been cut down and hopefully will bring another diverse and colourful display again next year. We still have a few last lingering blooms, but for the most part now all is finished. A fair bit of time is taken over by a steady round of leaf collecting as the tree canopy turns to its seasonal mix of red and gold – some are gathered together to slowly mulch down – for the majority a smouldering bonfire steadily puffs away dispersing its smoke over the Parkland. 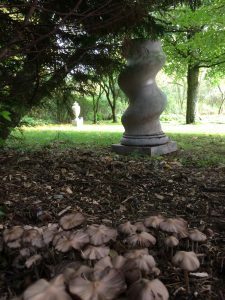 More work continues in the Little wood by the entrance – the Wild Stone Sown with Free Letters has been given a new permanent home there and is an appropriate homage to IHF and the garden. This whole area continues to be cleared and reclaimed. By the Top pond a clump of stipa grass has been split and extended along the edge and some of the more dominant flag iris removed. This should soften the whole effect of the perimeter planting and contrast nicely with the purple loosestrife also planned for there. By the Centre pond too trees have been removed – one tipped over naturally, along with some old willows past their prime – the cleared new area forming a more open grove planted with soapwort to naturalise in the understory. Passage over the stepping stones is also made less precarious from tugging branches hanging over. The IHF workshop shed has been cleared out and renovated – so that the little balsa wood gliders and boats can be seen clearly through the window as if they had just been set down. The other sheds too have been tidied up and given a new coat of preservative to make them last a good while longer. The Bring Back the Birch stone has been lifted and reset again vertically where it had been tilted off balance by old tree roots – a new brick base has been laid around it enhancing its setting. Most days now begin in a cold startling brightness, as autumn passes its metamorphic sweep through the garden.